Day 4, the last of my long trek. Today I’d set myself the goal of visiting the final two Trusts. Dyfed Archaeological Trust in Llandeilo, then my Trust, the Glamorgan-Gwent in Swansea. It was going to be difficult, but then which part of the ride hadn’t been! 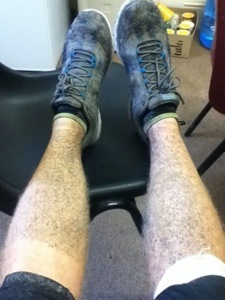 I checked in my Sustrans book and it said there was a nice tarmac and gravel cycle path (81/82) from Aber to Tregaron. So after breakfast (the rest of the previous nights pizza, all the luxuries me!) I turned my trusty stead southwards and headed for home. The cycle path started well…but soon descended into complete farce. 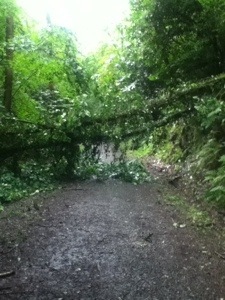 The description in the book should have read, ‘ path gravelled in places, but mainly mud, oh and fallen trees. This path is mostly suited for mountain bikes. Should not be attempted by people on tourers or road bikes with panniers! !’ It was a great track nevertheless, following the line of the old railway. I passed half hidden station platforms, where the ghosts of local villagers wait for trains that time and Dr Beeching have long done away with, and a section blasted through solid rock. the sound of my tyres through the mud echoing between rough cut faces. This majority of the track was through woodland, though the last 5 miles crosses Tregaron Bog and the change to open moorland is stark. Finally I reached Tregaron. I’m not sure who looked worse, me or my bike? We were both caked in mud and grime from the mornings adventure. 12miles had taken 2.5 hours! After sustainable of coffee and a chocolate and fig slice I set off again. In front of me lay the hills and I felt very unprepared. The ride to Lampeter/Cwmann was littered with small sleepy villages and hamlets, as I passed through Llanddewi-Brefi I noticed that I was the only cyclist in the village. As I reached the A482 I was in buoyant spirits, the mornings problems and the time delay on the cycle path were behind me and I’d made good time along the B roads. As long as I live the A482/ A40 from Lampeter through to Llandeilo will forever be my Everest. For those who are unfamiliar with this fine section of Britain’s. road network, the road is almost one long snaking continual climb! One of the highlights you pass on this climb is the Dolaucothi Gold Mines. The mines overlook the beautiful Cothi Valley, and were started by the Romans 2,000 years ago. Mining at the site continued in the 19th and 20th centuries, finally coming to a end in 1938. The site is owned by the National Trust and is well worth a visit. 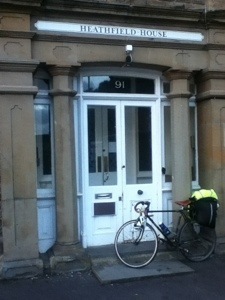 The climbing over (or so I thought) I pedalled wearily in Llandeilo and announced my presence at the Dyfed Archaeological Trust office. Water, coffee and biscuits were produced and a comfy chair for my saddle sore posterior. Thank you Alice and Marion for looking after a somewhat bedraggled and dirty traveller. After discussing my route and finding a more suitable one, which didn’t involve me climbing over multiple mountains, I set off again. It was kindly suggested before I left that I could be loaded into the back of the Dyfed van and driven to Swansea, but I passed on the offer, I had set off to conquer 4 Trusts in 4 days and the end was tantalisingly close now. Only the GGAT office to go! Leaving Llandeilo behind me the heavens once again opened in a mighty downpour and I wished I was in the back of a van. More climbing ensued. As a cycled through Llannon I caught my first glimpse of the Burry estuary and caught the taste of home on the wind. Through Llanelli, Dunvant, and onto the cycle path to the Mumbles. My legs hummed and my knee sung with pain, but on I rode. I turned the corner into Heathfield House, the home of GGAT, at 7pm. The carpark was empty the office shut for the night. As I photographed my bike in front of the office door as evidence of my presence, a small sense of achievement washed over me. 4 Trusts, 4 days. As the shadows started to lengthen, I turned on my bike lights and started the familiar ride from the office to home. I knew that a hot meal and a pint would be waiting for me in my local and many tales of the previous four days would be regaled to friends and loved ones, with various degrees of embellishment. A fitting end to my archaeological adventure.